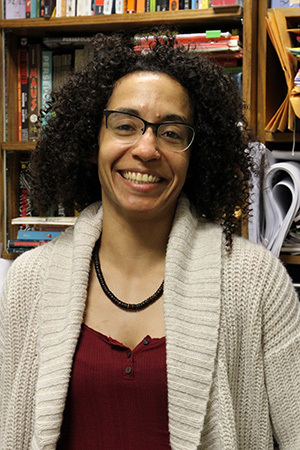 West Windsor, N.J. – Nicole Homer, a member of the English faculty at Mercer County Community College, has just published her first full-length poetry collection, Pecking Order. Homer describes the collection as an unflinching look at how race and gender politics play out in the domestic sphere. Homer’s poems explore the construction of racial identity and how familial love can both challenge and bolster that construction. The poems range from the intimate details of motherhood to the universal experiences of parenting; the dynamics of multiracial families to parenting black children; and the ingrained social hierarchy that places the black mother at the bottom. Homer says she hopes to force the reader to reckon with the truth that no one – not even the mother – is unbiased. Homer is an active member of the Association of Writers and Writing Programs. She recently attended their annual convention, where she read two selections from the book.